"Bain Capital", "Barack Obama", "Mitt Romney", "Newt Gingrich", "Obama/Biden 2012"
Mitt Romney's Estimated net worth is between $190 million to $250 million according to reports based on his filing with Federal Election Commission and most of it comes from Bain Capital, a venture capital firm he co-founded. Private-equity firms buy businesses the way that homebuyers acquire houses. They make a down payment and finance the rest. The financings are structured like balloon mortgages, with big payments due at some point in the future. The critical difference, however, is that while homeowners pay the mortgages on their houses, PE firms have the businesses they buy take out the loans, making them responsible for repayment. They typically try to resell the company or take it public before the loans come due. Played out within reasonable limits regarding the amount of the debt, the strength of the acquired company, and the continuation of som threshold level of investment to maintain that strength, it's a strategy that can offer big payoffs. But private-equity players are quintessential Wall Streeters whose grasp of the concept of reasonable limits is quite limited. For them, the whole purpose of doing business is to make money, so if a strategy works, each success is just an encouragement to raise the ante and be a bit more daring next time. To make a large sum of profit and have net worth in the Billions, it means PEs like Bain Capital LLC will do just about anything if it means downsizing and/or selling the new company's assets piece by piece if the bottom line is attractive with no regards to employees that have invested their livelihood. A Missouri steel company in which former Massachusetts Gov. Mitt Romney’s (R) Bain Capital was the majority shareholder went bankrupt, laid off more than 750 workers, and had to turn to the federal government for a bailout of its pension funds in 2001, according to a special report from Reuters. This of course is not an isolate indecent, as the Wall Street Journal analysis of 77 businesses Bain Capital has invested in shows that 22 percent of the companies either filed for bankruptcy or shut down by year eight. Amid anecdotal evidence on both sides, the full record has largely escaped a close look, because so many transactions are involved. The Wall Street Journal, aiming for a comprehensive assessment, examined 77 businesses Bain invested in while Mr. Romney led the firm from its 1984 start until early 1999, to see how they fared during Bain's involvement and shortly afterward. The Journal analysis shows that in total, Bain produced about $2.5 billion in gains for its investors in the 77 deals, on about $1.1 billion invested. Overall, Bain recorded roughly 50% to 80% annual gains in this period, which experts said was among the best track records for buyout firms in that era. Mr. Disgruntle Republican candidate Newt Gingrich in Manchester, New Hampshire, sure is on a mission exposing the saddest truth about Mitt Romney and unintentionally about most private equities not to mention that these firms are the same kinds of Wall Street vultures he has been catering to for so long but now they seem so evil when it is convenient to hit his arch rival Mitt Romney below the belt debunking Mitt's "I am a job creator" meme. Glad Newt is exposing not only Romney's but also his own shortcoming as he levels one of the merciless rebukes on Mr. Romney. “Those of us who believe in free markets and those of us who believe that, in fact, the whole goals of investment is entrepreneurship and job creation, would find it pretty hard to justify rich people figuring out clever, legal ways to loot out a company,” former U.S. House Speaker Newt Gingrich told reporters in Manchester, New Hampshire, yesterday, ahead of the state’s Jan. 10 presidential primary. Of course Newt was referring to what Romney has been doing for decades as stealing form hard working Americans which by the way is spot on. That is a tough charge to recover from coming from a Republican. Well, wait till you see Newt's PAC ads hitting Romney hard like no one's business below. The Daily Beast in the article by Peter J. Boyer further reports about the ugly and dirty laundry of Mitt Romney's work at Bain Capital. Jason Killian Meath, a former campaign aide to Romney during his 2008 bid for president is someone you sure don't want to piss off or be in the wrong side with because he certainly unleashed a heavy hitting attack video blasting Mitt’s work at Bain Capital. The video trailer and some ad used by pro-Newt Gingrish PAC is cut throat but extremely convincing (read Daily Beast's summation for transcript) and watching the videos below sends chills to the stomach about how easily a crook could really be elected President of the United States. Wait a second, did I hear Newt saying something like "American people deserve a respectful and constructive campaign that focuses on a vision for rebuilding the country we love"? Well, you be the judge of that bogus fronting after reading his statement yourself here that portrayed himself as taking the higher ground by refraining from exchanging attacks with his Republican rivals -- and keeping his focus on President Barack Obama. Oh well, that is short lived but certainly a great move by Newt if he has any chance or hope of slowing down the momentum Romney is building towards the New Hampshire primary. One thing for sure is that all of this Republican feast fight going on is just great for President Obama's general election chances not that anyone would think the President won't clobber all of the candidates combined. If all that is not enough, wait until you hear what Brain Rose has also uncovered about Mitt Romney's off shore investment where Romney has sheltered his millions in off shore jurisdictions like the Cayman Islands that offer huge tax advantages to investors, a safe haven that will allow Romney to avoid having to pay taxes in the United States. But, what's most important to highlight is that Bain Capital LLC is one of the private equity firms that has established an investment firm to aide investors from paying their share of taxes. Yes, Mr. Romney can tell us a whole lot of what people wants to hear but the truth will be blogged until he is 110% unmasked. The saddest part of all this is, Mitt is just a quintessential dishonest person who is his own worst enemy especially if you watch the video below. 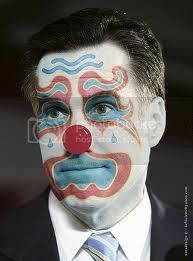 By the time everyone takes their turn and expose Romney for who he is and what he stands for, if he become the nominee, the guy will indeed be a masked damaged good. All the better for Democrats!